The Upholstery Shop was designed to support all aspects of the refurbishment and interior detailing processes at Wisetouch. With 1500 square feet of production space and 12 upholstery technicians, accommodating a customer’s schedule is what we do best. Our on-site upholstery shop consists of a large staff of highly trained pattern makers, designers, upholsterers, seamstresses, foam makers and builders. Everything is possible in our shop, from full refurbished interiors to repair and correction of damaged soft goods. We extend our knowledge to the client in choosing the best and most cost effective solutions. Our shop prides itself in operating some of the best equipment in the industry. Top performing machinery such as Pfaff, Atlas, Grizzly and Nakajima are used insuring quality and consistency in all our deliverables. We provide leather upholstery repair and refurbishment, panel and side covering repair, as well as carpet repair and installation. The possibilities are endless here at Wisetouch. We can support you and all your interior needs. Our Upholstery shop and state of the art equipment, promote quality craftsmanship. 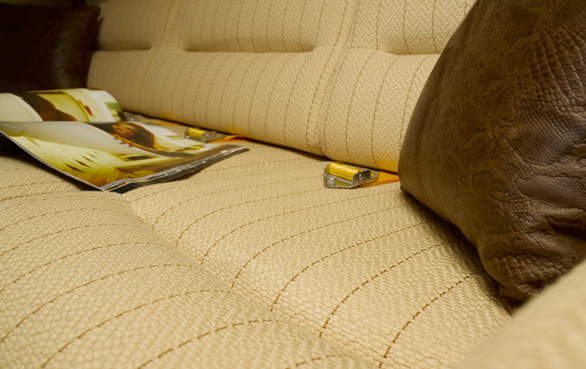 Our techs are trained in the latest products and materials, insuring longevity in the upholstery and refurbishment. We also accommodate specialized customer requests, such as flammability testing.